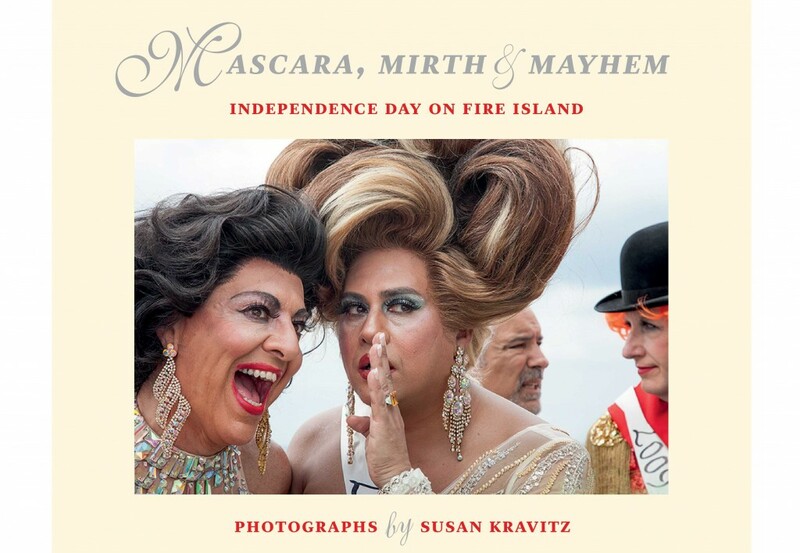 KMW studio proudly announces the July 2016 publication of Mascara, Mirth & Mayhem: Independence Day on Fire Island, by renowned photographer Susan Kravitz. The Invasion of the Pines occurs every July 4th and involves participants from the Fire Island communities of Cherry Grove and Fire Island Pines. It began in 1976, when a member of the Cherry Grove community had been refused service in a Pines’ restaurant because he had been dressed in drag. In protest, a small group of Cherry Grove residents cross-dressed and took a water taxi to the Pines on Independence Day of that year, to stand up against this “height of insult” by “invading” their neighboring community. Four decades later, the Invasion has evolved into a uniquely raucous event that joyfully celebrates human rights and freedom of expression by thousands of people, straight and gay. Kravitz’s photographs capture the rebelliousness, the high camp, and the joy of the Invasion. They are provocative, introspective, sad and funny, and tinged with sexual innuendo. Yet they also reflect another journey, one that gives insight into the LGBTQ movement itself. From the fearful, AIDS-ridden years of the 1980s and 1990s, to the joyous years of this decade when LGBTQ people are out and proud (and, if they choose, legally married), these Invasion photographs celebrate a day to be free, to be whoever you want to be, and to be gay. Susan Kravitz is a social documentary photographer of daily life. Over the past thirty years she has exhibited her photographs in galleries and museums in the United States and abroad, including China, South Korea, Russia, Germany, Great Britain, Italy and the Czech Republic. Her Cherry Grove photographs were recently featured on the New York Times Lens blog (A Gay Haven on Fire Island) and in the International New York Times, Paris edition. Kravitz, a native New Yorker who holds a BA degree in Sociology from Barnard College, first picked up a camera in her early twenties. Twenty years later, she seriously considered becoming a fine arts photographer and educator, earning an MFA in Photography from Long Island University/Post. In 1988, Kravitz became a full-time Photography Instructor in the Art Department at Nassau Community College, Garden City, NY. She served as Chairperson of the Art Department for nine years before her appointment, in 2004, as Dean for Arts and Humanities at Nassau Community College. Since 2010, Susan Kravitz has devoted herself exclusively to fine art photography (www.susankravitz.com). She is a founding member of fotofoto gallery in Huntington, NY (www.fotofotogallery.org), where she has exhibited her photographs for the past thirteen years.